Sales professionals are inundated with goals: quarterly sales goals, cold-calling targets, customer acquisition objectives – the list is endless. And that’s a problem when it comes to coaching. There are so many targets to reach and sales skills to master that coaching conversations can very easily become diffused and consequently ineffective if coaches don’t know how to zero in on the one or two things that truly matter to reps. The relationship between goal setting and coaching is close. Both are essential to sales success, and both are most effective when the other is firmly in place; however, the skills required to set and achieve a personal goal and the skills required to coach others through that challenge are very different. That’s why many managers are not as effective as they could be at guiding team members toward their individual goals. “Coaching is the number one management activity that drives sales performance, and most managers are poor coaches,” says Steven Rosen, a performance coach and founder of STAR Results, a sales-leadership coaching, training, and consulting organization dedicated to leadership development. The reason, he says, is that very few managers had great coaching role models when they were sales reps. As leaders, they now fall into a number of common traps when it comes to helping their teams set and attain performance goals. To avoid the pitfalls, follow these recommendations from Rosen for coaching your reps to achieve their goals. Put the rep in the driver’s seat. How likely would you be to put 100 percent effort toward achieving another person’s goal? Not very likely, right? The same is true for sales reps; they are not going to give it their all if they are working toward their managers’ goals, rather than their own. Your job as a coach isn’t to set your reps’ goals, but rather to facilitate the reps’ setting their own goals and plans for achieving them. This is the only way to get buy in from your reps.
What if a rep sets a goal to improve an aspect of his or her performance that you don’t think is really that important? That’s OK, says Rosen. Support your rep anyway. As he or she achieves successes, over time that rep will hit on the major items that will measurably change his or her performance. Less is more. Reps should be working toward no more than one or two goals at a time. Any more than that and their focus will become so scattered that they likely will not make progress on any of them. Think about it this way: if someone handed you five balls and told you to shoot them into five different baskets simultaneously, your chances of getting even one in is slim. If you had just one ball and one basket, however, all your attention would be focused in a single direction, exponentially increasing your likelihood of success. Too often, managers finish a coaching session by leaving their reps with five or six things to work on and then are disappointed when little change happens. “If a rep can develop in one area and goes from a four out of ten to a nine in that area, you’ve done a great job as coach,” says Rosen. Keep the goal front and center. When a rep first sets a goal, motivation to achieve it is usually high. As time passes, however, the busyness of keeping up with daily tasks can overshadow that goal, and the rep’s focus on it can slide. The same is true for busy managers who too often coach to the moment: they see a problem with a presentation and tell the rep how to do it better next time. Or they listen in on a cold call and tell the rep how he or she needs to improve. While certainly there will be non-goal-related issues that crop up and need attention, always make sure that the goal is central to your coaching efforts, Rosen says. “Every time you are interacting [with your reps], you want to go back to the goals,” he explains. “Ask them, ‘What are your challenges? What successes have you had?’ Keep reminding them that this is important.” This kind of attention on goals will ensure that reps stay focused on them, prioritize them and, ultimately, achieve them. Demand accountability and celebrate success. If your coaching conversations are anchored in discussions about goal progress, you will know when your reps are on track to meet goals and when they aren’t. For reps whose progress is lagging, hold them accountable to the plan they developed. “Say to them, ‘You haven’t done this; when do you think you’ll do it? '” says Rosen. Get a commitment and hold them to it. Conversely, when a rep reaches a goal, be certain to celebrate it. One of the most meaningful things you can do as a leader, says Rosen, is to deliver a handwritten note congratulating a rep on a job well done. Your rep will not only keep it but treasure it – and be motivated to plan for his or her next goal achievement. When working with his clients, Rosen uses a coaching model visually represented by a circle. In the center of the circle is a smaller circle, which he calls the Coaching Mind-Set, an “ask, don’t tell” frame of mind that must permeate every other aspect of the model. Closing the Loop. During every interaction, close the loop by asking, “How is it going with your goal to improve your presentation skills?” When you are in one-on-one coaching, nearly everything should be focused around the specific area targeted for improvement. Accountability drives change; coaches hold reps accountable by keeping them focused on the target. Self-Evaluation. Coming out of a sales call with a rep, a manager’s natural tendency is usually to start giving feedback, such as, “You did this well, but you might want to try this approach next time.” But you want your team in the habit of self-evaluating, and the way to get there is to ask such questions as, “What do you think worked well? What would you do again? What would you do differently? What will you do next time you see this customer?” These kinds of questions prompt reps to think critically about their performance – something you want them doing whether you are there or not. For more information, visit www.starresults.com. Whether you’re a professional sales rep or a professional athlete, goals are essential to driving higher performance. To better understand the link between the two, we talked to Mark Verstegen, founder of Athletes’ Performance (AP) and Core Performance (CP), leaders in integrated performance training, nutrition, and physical therapy for elite and professional athletes. He shared these thoughts on goals. 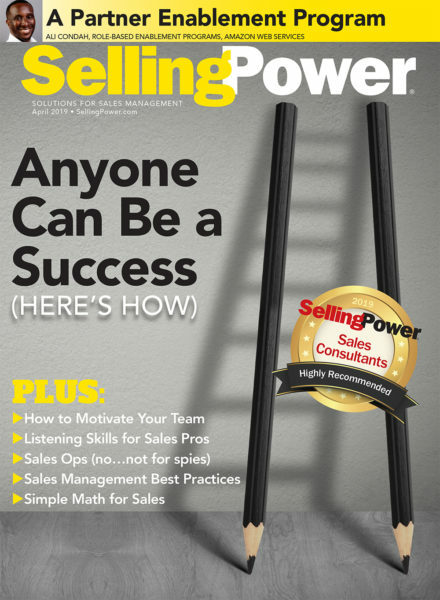 Selling Power (SP): How does goal setting fit into the coaching of athletes? Verstegen: Whether you’re an athlete or an executive, goal setting is critical. At AP and CP, we refer to someone’s “it” – what drives him or her at the deepest level to get one second faster or stay one minute longer on the treadmill. Ultimately, goal setting for athletes is the same as goal setting for folks in business: goals should be specific, actionable, time sensitive, and attainable, and our role as coaches is to urge people to dig deeper to identify what truly moves them on a daily basis and build a plan to help them achieve that goal. SP: Can athletes attain peak performance without a specific goal? Verstegen: Ultimately, health is a marathon, not a sprint, so while it’s possible to improve your health in the short term without specific goals, your long-term health is predicated on always having a force behind you driving you to stay engaged and work harder. SP: What does the goal-setting process look like for your athletes? Verstegen: We refer to this process as “the IT illuminator.” We encourage athletes and employees to set their goals, and it’s the coach’s job to ask questions to ensure that the goals meet all the criteria outlined above. Many of our athletes will say, “I just want to have a good season,” but once we ask them questions and push on that a bit, we end up with a more specific goal, such as, “I want to strengthen my lower back so I can reduce my injury risk and have a healthy season this year,” which is significantly more helpful. So our job as coaches is to be active listeners and motivate and educate our athletes to ensure that they are truly training daily toward goals that are meaningful to them as individuals, athletes, and community members. For more information, visit www.athletesperformance.com. 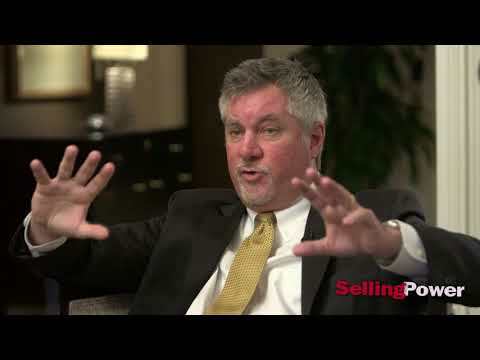 Most sales managers have been top sales reps and are eager to share their wisdom and prescriptions for success with their reps; however, the job of the coach is not to tell reps how things should be done but instead to ask questions that prompt the rep to think critically and come up with his or her own answers. This is one of the toughest challenges for sales managers: muting the inner lecturer and turning up the volume on the inner counselor, who asks thought-provoking questions through which reps intrinsically seek to achieve higher levels of performance. “When there’s a problem, most managers go immediately into tell mode: ‘Here’s what I did to be successful, so if you do this, you’ll be successful, too,'” observes Rosen. Or they’ll pull up an Excel spreadsheet with the rep’s numbers and pronounce, “Here’s your problem.” But this approach is counterproductive. Rosen has worked with countless frustrated managers who begin explaining how they’ve tried to help their reps by saying, “I told them to . . .” It doesn’t matter what comes next, because they’ve just articulated the problem: they are telling their reps what to do. The next time you interact with your reps, turn off the tell switch. Listen to their concerns, ask them why they think they are experiencing the problems they’re having, ask what they’ve tried and what has or hasn’t worked in the past, and then watch the light come on as they begin to solve their own problems. When that happens, you’ll also see higher levels of motivation, improved performance, and an increase in confidence.